Positive emotions, such as joy, excitement, and love, often have an equally positive impact on our singing. These emotions help us to feel confident and engaged in what we’re doing, meaning our breathing is more free, our sound is focused, and we blend well with other singers around us! Negative emotions, such as fear, stress, or anger, can have a deleterious effect on our singing. These emotions inhibit musical expression, often dragging pitch down, introducing bodily tension, hindering supported breathing, and freedom in our singing. One of the most wonderful aspects of music is how engaging in it, whether through listening, or playing an instrument, can actually change your mood! If you’re experiencing negative emotions, one of the best things you can do is start singing! Singing forces you to pay attention to your body, to stay in the present moment, and to regulate your breathing that creates a meditative effect. Plus, singing in a choir with others, has been shown to have a very positive effect on mental health! 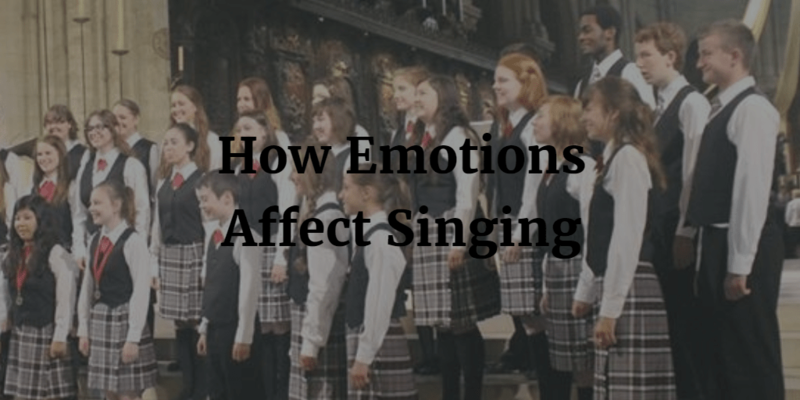 How else might our emotions affect how we sing? Tell us in the comments below!